If you're feeling like Samsung is nailing the smartphone market at the moment, but you can't afford the almost-extortionate Galaxy S8 (despite it being the best phone in the world) - then the new Samsung Galaxy J5 and Galaxy J3 could offer you a route in. Well, we say that, but these aren't the Galaxy S8 rebooted with a lower spec list - but they do offer a premium build for a lower cost. The J5 and J3 come packing a metal body, and the J5 has a 5.2-inch Full HD Super AMOLED screen, which is pretty high-end for a phone we're expecting to cost a lot less than standard flagships. (For comparison the OnePlus 3T, a recognised flagship phone, uses a Full HD Super AMOLED display). The Samsung Galaxy J5 is 'more compact' of the two new phones, and offers a 13MP camera front and back (the former likely to be pretty good in low light as it's got an f/1.7 aperture). It's also upped the speed to a 1.6GHz CPU, offering an octa-core chipset, as well as packing a 3000mAh battery. The J5 also offers expandable memory to augment the 16GB on board, with cards up to 256GB accepted. 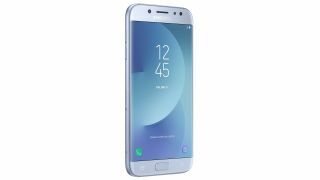 The Samsung Galaxy J3 comes with a 5-inch HD screen, and is LCD rather than the Super AMOLED technology. From what we can gather, the metal body isn't full but part of the design, and there's 2GB of RAM along with a 13MP rear camera. It's got a quad-core CPU, running at 1.4GHz, and features expandable storage of up to 256GB as well. With a 2400mAh battery, it's also running Android 7 Nougat, and features a 5MP front-facing camera.